Online ordering menu for The Original Dominick's. 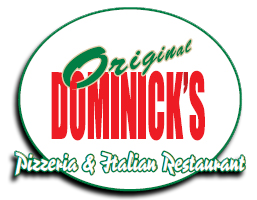 Welcome to the Original Dominick's Pizzeria! We are a local favorite here in Perkasie as customers love our flavorful and authentic taste. Our menu includes the best pizza in the region and also has a long blend of Italian favorites to choose from. We have Strombolis, Sandwiches, Calzones, Burgers, Seafood, Pasta, Wraps, Salads and much more. We are located Dublin Pike across the street from Kirk's Auto Body Shop and next to the 313 Self Storage. Order online for take out or delivery!